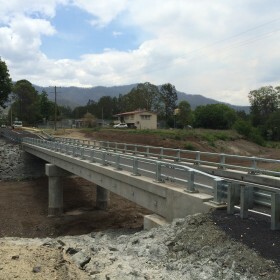 Earlier this month, National Structures Manager, Ashley Ruffin, attended the opening of the Clarke Bridge which spans Laidley Creek at Thornton, located in the Lockyer Valley. Following the January 2013 floods, the local community was left without use of the bridge or direct access to the other side of the valley. The design was a joint effort between our Structures team in Melbourne along with Civil Infrastructure, Civil Urban and Structures in Brisbane. They worked as part of a design and certification team with Shamrock Civil. Although a difficult project for all parties, the relationships on completion are very good with thanks being provided personally from the Mayor, who opened the new Clarke Bridge in recognising how difficult the project had been and the efforts by all, the local Mayor personally thanked all involved, while officially opening the bridge in the presence of the local school and community.